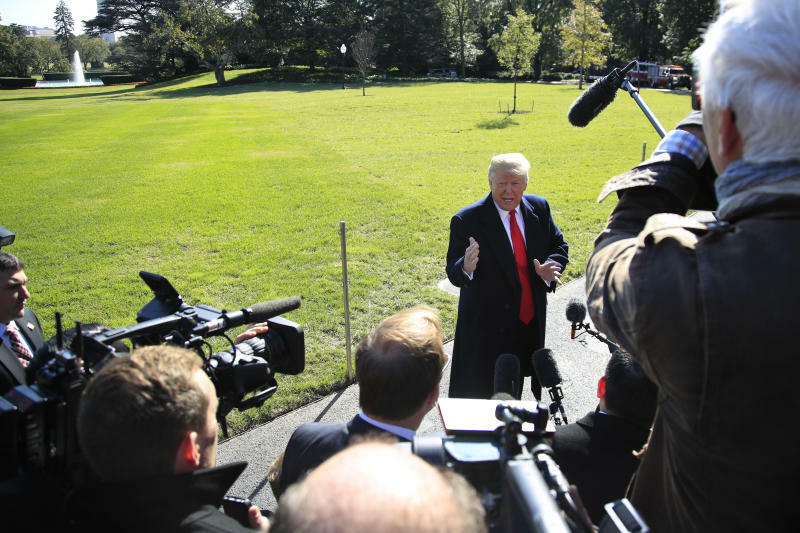 WASHINGTON (AP) -- President Donald Trump says he wants to push a new middle-income tax cut through Congress after the midterm elections, though he's not offering specifics on the plan. Trump said Monday he's looking to cut taxes by about 10 percent for middle-income people. The proposal follows the massive tax law that Republicans muscled through Congress late last year and Trump signed as his major legislative achievement. With the midterm elections in two weeks, polls have shown only tepid support among voters for that package of individual and corporate tax cuts that took effect Jan. 1. It provides steep tax cuts for corporations and the wealthiest Americans, and more modest reductions for middle- and low-income individuals and families. Trump, leaving the White House for a campaign rally in Texas, told reporters, "We're doing it now for middle-income people. This is not for business. This is for the middle." Coming so close to critical elections, the proposal appeared to be a tacit acknowledgement by the Trump administration that the $1.5 trillion package of tax cuts failed to deliver the political traction that Republicans had hoped for. "This is just a political exercise," said Steven Rosenthal, a senior fellow at the nonpartisan Urban-Brookings Tax Policy Center. "Republicans are realizing they have to do more to help the middle class." The lukewarm response to the tax law prompted Republican lawmakers to speed new legislation through the House in September, as they rushed out of town to face voters, to expand the tax law. The new bill would make permanent the individual and small-business tax cuts in the law. Prospects in the Senate for the legislation were weak. Trump said over the weekend that he hoped to move forward with the plan "sometime around" or before Nov. 1. But Congress is currently out of session as lawmakers campaign for the Nov. 6 elections. "We're putting in a resolution sometime in the next week or a week and a half, two weeks," Trump said Monday. The tax cut proposal could be included in a continuing resolution to fund the government on a short-term basis. Around 25 percent of federal spending hasn't yet been approved for the rest of the fiscal year, so in theory it would be possible to put in new tax cuts in the lame-duck session. Lawmakers, however, already have a heavy agenda for the session. Some Republican lawmakers hope to pass a budget resolution during the session — enabling legislation to be passed by a simple majority in the House and Senate, as happened with the tax legislation last year. Details of the new plan are said to be coming later. It was not immediately clear, for example, how the administration proposed to offset the loss of revenue from a broad tax cut. "It is not clear to me if there are going to be 'pay-fors' for this," said Mark Mazur, director of the Tax Policy Center. "With the federal budget deficit nearing $1 trillion per year, there may be some concern about adding to it indefinitely." If there are "pay-fors," that could make congressional passage more difficult, Mazur said. Nicole Kaeding, director of federal projects at the conservative Tax Foundation, noted there have been major tax cuts put through in lame-duck sessions. Tax cuts enacted under President George W. Bush's tenure were extended in 2012 during Barack Obama's administration, for example. Without details of the new plan, "It's hard to know what exactly the president has in mind," Kaeding said. Sen. Ron Wyden of Oregon, the senior Democrat on the tax-writing Senate Finance Committee, called Trump's statements "empty rhetoric" and "an admission ... that his tax law only helps corporations and the donor class."